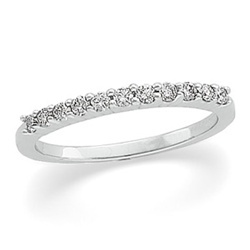 This breathtaking platinum wedding band is built using .950 platinum and comes in a width of 1.7mm. Eleven genuine round full cut diamonds are used in building this 1/5 carat total weight diamond wedding band. Classy and timeless, this platinum wedding band is perfect to show your love and affection. Consider setting one on each side of the engagement band to truly set your engagement ring apart!